Ely Buendia talks about his short film "Waiting Shed"
Ely Buendia fulfills his dream of becoming a filmmaker by directing his first indie film titled Waiting Shed. Produced by Cinemanila, this 13-minute short film will be shown starting November 26 as part of Eraserheads Reunion Concert: The Movie. As soon as Ely Buendia walked down the red carpet laid outin front of Cinema 9 of SM Megamall, people started chanting, "Ely! Ely!" 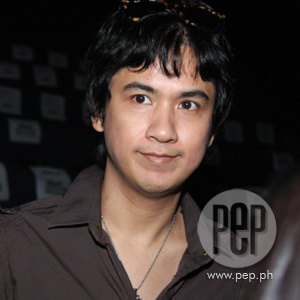 Theformer vocalist of The Eraserheads attended the premiere of the band's reunionconcert-turned-movie titled Eraserheads Reunion Concert: The Movie. Itwill be shown in SM cinemas starting November 26. According to a source from Sony BMG, they came up with theidea to show the concert on the big screen about a month ago. During the premiere night held last night, November 24, Elytalked about the indie film that he made with Diane Ventura, his longtimegirlfriend. Titled Waiting Shed, this 13-minute short film is producedby Tikoy and Anima Aguiluz of Cinemanila. It was shown in Marikina Cityrecently as part of Cinemanila's Sine Barangay. "Diane and I wrote the script pero it's mostlyimprovisational and mostly an experimental work," Ely told PEP (PhilippineEntertainment Portal). "The concept is waiting for something to happenbasically...kaya Waiting Shed." In this short film, Diane plays a nurse who spends some time in a waiting shedlocated along a major street. Do you have other indie projects in the future? "I hope so.This is the first time I did something like this and I'm very thankful forDirek Tikoy Aguiluz for giving me the opportunity to make it. I had so much funand kumbaga it's a dream come true for me." How long did you shoot the short film? "Parang real timeyun, e. We started shooting midnight until morning." Do you see yourself doing a full-length film in the future?"Definitely. I've been wanting to do this since I was in college. Of course,I'm really excited about this." Ely's 13-minute short film Waiting Shed and MarcusAdoro's short film The Artist Is In will be screened prior to theirconcert-turned-movie.